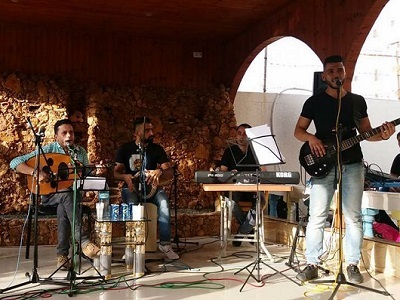 A Gaza band aims to break the cultural blockade through reviving classic Palestinian resistance songs and performing these across the Gaza Strip. The band, Maimas, is based in Gaza and features well known academic and activist, Haidar Eid as singer. It is named after the ancient name of the port of Gaza City and has five musicians playing the Oud, Tabla (drums,) Keyboard, Naii, and Guitar. Featuring Mohammed Akila on Oud, Eyad Ablial on Tabla (drums), Fahmy Saqqa on keyboard, Ismail Harazeen on Naii, Ahmed Haddad on Guitar and Dr Haidar Eid and Mohammed Akila on vocals, the band has to date been unable to record its first album in a recording studio and has had to rely on smart phones to do the job. According to Haidar Eid, “songs are an organising tool in the arduous work of overthrowing occupation and apartheid. 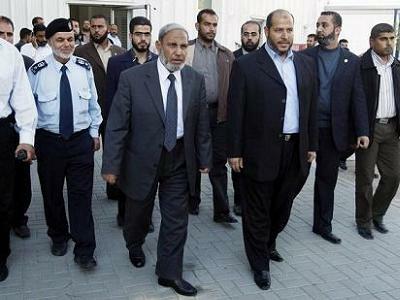 They are permanently etched in the collective memory of the people of Palestine. We hope that our songs will document Palestinian desire to be free from the ravages of colonialism, occupation and apartheid”. Art in Gaza is itself under a horrific, medieval siege, a siege that is the literal antithesis of freedom. Apart from these two projects, Maimas has already started collecting material for its potential album that will consist of a revival of the songs of the first Intifada, and banned Palestinian songs of the 70’s and 80’s. A global fundraiser is currently underway on Give A Little to raise funds to cover the costs of recording this album in a recording studio. All funds raised go directly to the band to cover their costs. 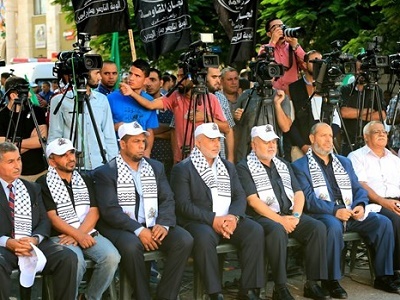 Maimas is also hopeful that in the future, they will be able to perform concerts from Gaza that will be broadcast to the rest of the world via video conferencing. Currently, two such concerts are in the planning for New Zealand and South Africa. In this way, although the band members are prevented by the barbaric Israeli siege on Gaza from leaving the Gaza Strip, their music will cross borders and break the cultural blockade that is being imposed on Palestinian artists. “By singing, getting our voices heard, we are, in fact, using music as a tool of resistance” says Haidar. It is not anti-semitism or bigotry to recognise the abominations that Jews in Palestine are inflicting upon the Palestinian Nation, every hour, every day,every week, year upon year without respite. It is not anti-semitism or bigotry to recognise the equally abominable War Crimes and Human Rights atrocities that the Palestinian Peoples are forced to endure at the hands and diabolical minds of their occupier, oppressor, invader. Claims asserted by the Jewish Peoples in Palestine, maintaining their unmatched standards of democratic humanitarian credentials, when considered against their actual psychologically deluded realities, must surely qualify as definitive oxymoron delusions.